Limited edition of 1904 prints 20"(524mm) x 29"(743mm), 16 June 2004. Dublin (Baile Atha Cliath) had long been on Stuart's list of cities to paint, his motivation including a tribute to Dublin-born James Joyce which is captured in the painting's title. The special atmosphere that exudes from the streets of this friendly city has attracted Stuart to return over the years. As he disembarked at Dublin Port in the summer of 2003, he felt some trepidation. His task was to capture the feeling and sights of this extraordinary city and reflect it in one of his unique cityscape paintings. In the following days he walked most of the city centre streets observing and photographing, whilst in the evenings he enjoyed the craic in some of the famous pubs that can be seen in this Dublin painting. Armed with his photographs, guide books, maps etc, Stuart went back to his attic studio in Wales to start the creative process that would take him nine months to complete. His enthusiasm for cityscape painting has to be matched by his patience in building up such a detailed composition over so many months. 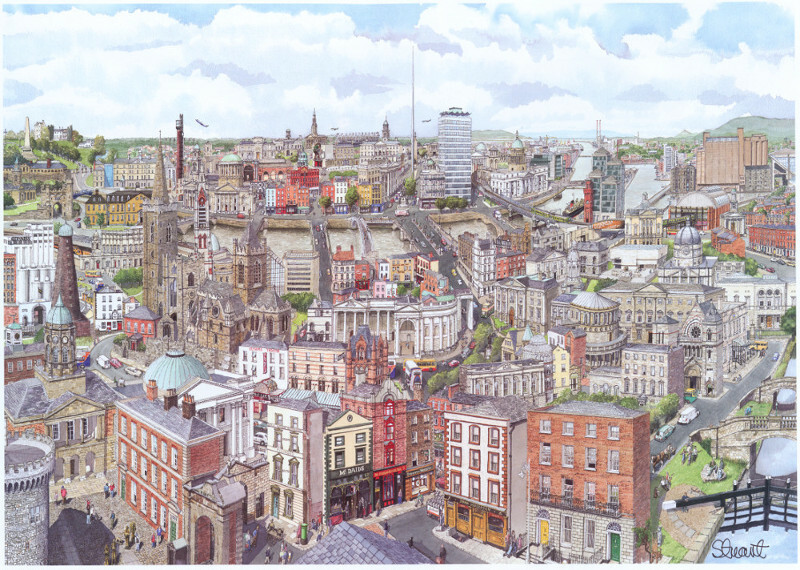 In this Dublin print he includes the Castle, well known pubs and bars, College Green and Trinity College, government buildings, churches, cathedrals, the Liffey and most of its bridges, statues honouring the city's literary and historic figures including Joyce, a well known brewery, the GPO and so on. In fact over 150 named landmarks appear in this Dublin painting. Stuart felt it was appropriate to reflect the 100 year celebrations of James Joyce's Ulysses character Leopold Bloom, who wandered the streets of the city on 16th June 1904, by publishing 1,904 limited edition Dublin prints from his original watercolour on the same date in 2004, Bloomsday. He titled his picture 'ReJoyce Dublin' with kind permission of the organisers of the 2004 James Joyce celebrations.